I haven’t been able to write a blog for several weeks. These days I’m like the driver who can’t help but stop and stare at the horrifying wreck in the road and then wonder why she can’t focus on anything else after that. I returned to Facebook today for the longest look I’ve taken in a while, and though on my news feed much depressing information dominates, I found FB friends celebrating anniversaries, playing with their grandchildren, enjoying winter sports, and finding ways to temporarily put national politics out of their minds. 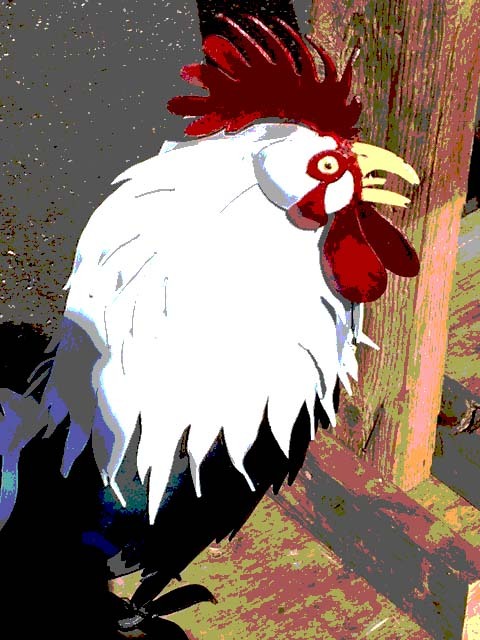 I decided I could and should return to blogging about more mundane topics in life, topics such as roosters. The Year of the Rooster has just begun. This colorful bird, which represents loyalty, punctuality, independence, a quick mind and a warm heart, sounds like a better icon for 2017 than…well, you know. 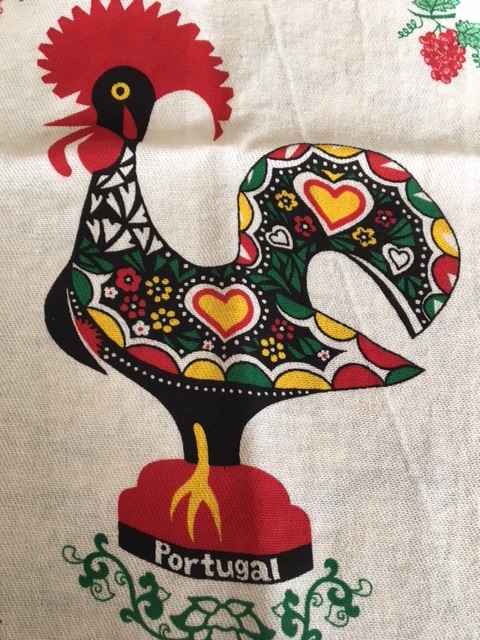 My husband and I became interested in roosters when we spent part of several summers in Guanajuato, Mexico. As lifelong “city slickers,” we had bought into the “alternative fact” that roosters crowed only at dawn. We were wrong. The city-bred “roof roosters,” as we called them, saw fit to crow any time of the day or night. They made sleep more difficult because they sounded off at night when there were no daytime noises to mask their racket. One exception: we were there during a total eclipse of the sun and as the sky darkened the roosters did go silent, then crowed their hearts out when the light of the day’s second dawn flooded the sky. 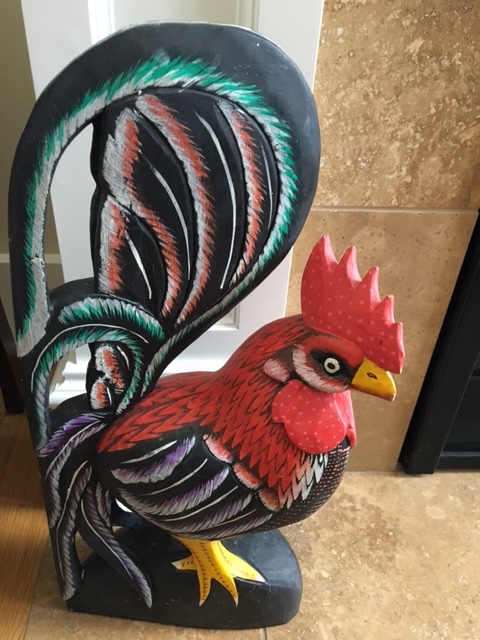 Since then, we have photographed roosters in Portugal, Iceland, and the U.S., bought rooster memorabilia, and even purchased a loyal wooden rooster who silently guards the fireplace hearth. Of course, like all the members of the Chinese zodiac, the person born in a rooster year has his faults. These include: “Impatient, critical, eccentric, narrow-minded, selfish.” This year, these don’t sound so bad. Roosters (and chickens) are such interesting, colorful animals! Artists have a great deal of fun creatively drawing and painting them. I love the one on the top left, from Portugal. So you aren’t loyal to puffins ! i confess. I have divided loyalties. I like herons, all the birds that attack our backyard suet and seed feeders, the neighborhood ospreys that nest over the parks dept. baseball field, penguins, and others.